Just after “ab koi bhed bhav nahi” campaign in Mumbai, idea cellular launches two full value vouchers, one Bachat recharge for Local calling and an irresistible per second ISD calling offer. The 2 full value recharge vouchers are priced attractively at 9 & 11. 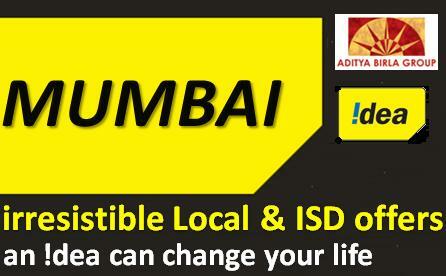 If e-recharged with Rs.9 you will get Rs.9 as full talk value which can be used for local as well as National calling. The validity of this pack is 2 days. If e-recharged with Rs.111, you will get a full talk time of Rs.111 and will be valid till your account’s expiry date.The Bachat recharge which is priced at Rs. 40 gives the benefit of talking 120 minutes to any local Number across Mumbai, Maharashtra & Goa with 30 days of tariff validity. The benefit of this pack is that it doesn’t carry any effective rental and also all calls are effectively 30 paise. Now here comes the irresistible per second ISD offer which is priced at Rs. 60 which also comes with Rs. 54.4 ISD Talk time. The call rates are for US,[email protected]/sec. ; [email protected]/sec.,Oman, Qatar @Rs0.18/sec., [email protected] Rs0.08/sec. ; Singapore, Malaysia, Thailand, China, Hong Kong, UK Fixed & France Fixed @Rs0.08/sec., Spain, Netherlands, Romania, Russia @Rs.0.40/sec. Benefit Rs 9 for local & STD voice calls Full Talk time 120 free Local Minutes US,[email protected]/sec. ; [email protected]/sec.,Oman, Qatar @Rs0.18/sec., [email protected] Rs0.08/sec. ; Singapore, Malaysia, Thailand, China, Hong Kong, UK Fixed & France Fixed @Rs0.08/sec., Spain, Netherlands, Romania, Russia @Rs.0.40/sec.